Congressman Mike Honda's (D-Silicon Valley) letter to Attorney General Loretta Lynch requesting a full investigation into the arrest of Ahmed Mohamed. letter, and archive link. We write to ask you to investigate the circumstances surrounding the arrest of Ahmed Mohamed, a 14-year-old student at MacArthur High School in Irving, Texas. As you may know, on September 15th, 2015, Ahmed was removed from his classroom to be interrogated by Irving police officers and the principal of MacArthur High School after proudly showing his teachers an electronic clock that he had constructed at home. Ahmed was interrogated for over an hour for what police later claimed was a "hoax bomb". Shortly afterwards, Ahmed was humiliatingly removed from his school in handcuffs and taken to a juvenile detention center where his fingerprints and mug shot were taken. It is important to note that Ahmed was denied his civil rights on numerous occasions as he was consistently refused his right to speak with his father. Texas Family Code clearly states "a child may not be left unattended in a juvenile processing office and is entitled to be accompanied by the child's parent, guardian, or other custodian or by the child's attorney." 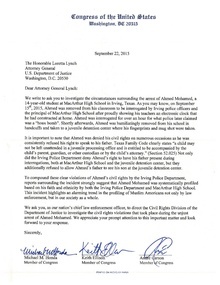 (Section 52.025) Not only did the Irving Police Department deny Ahmed's right to have his father present during interrogations, both at MacArthur High School and the juvenile detention center, but they additionally refused to allow Ahmed's father to see his son at the juvenile detention center. To compound these clear civil rights violations by the Irving Police Department, reports surrounding the incident clearly suggest that Ahmed Mohamed was systematically profiled based on his faith and ethnicity both by the Irving Police Department and MacArthur High School. This incident highlights an alarming trend in the profiling of Muslim Americans not only by law enforcement, but in our society as a whole. We ask you, as our nation's chief law enforcement officer, to direct the Civil Rights Division of the Department of Justice to investigate the civil rights violations that took place during the unjust arrest of Ahmed Mohamed. We appreciate your prompt attention to this important matter and look forward to your response.